Welcome back to the eGullet Klatsch Series! A Klatsch is "a casual social gathering for conversation," an opportunity to discuss a current culinary adventure with the eGullet community. For more information, see the Klatsch Announcement; you can ask questions here. 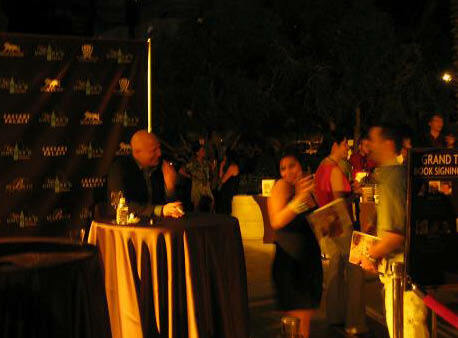 In this installment, David Ross finds himself in Las Vegas to take part in Bon Appetit's "Vegas Uncork'd" event. David has a packed schedule featuring some spectacular names in the restaurant business -- but we'll leave the name-dropping to him! Do you have something coming up in your culinary life that you think would make a great Klatsch? Head over to the Klatsch Announcement page and review the information there, and then send a PM or e-mail to the Klatsch Team! In recognition of the value of this special feature and to make others like it possible, please take a moment, if you have not already, to upgrade to a Society Donor membership. If you are not yet a member, please first join the eGullet Society. Thank you Klatsch team for the generous introduction and this unique opportunity. “Uncork’d” gives both food professionals-Chefs, Food Writers, Vintners and Restaurateurs-along with the general public at large, the opportunity to immerse themselves in four days of food, dining and interacting with “celebrity” Chefs like Bobby Flay and Cat Cora. (The “celebrity” chef is of course a very large presence in Las Vegas). Some associate an event like “Uncork’d” with people coming to Las Vegas to indulge in four days of decadence, (and of course, many of them do just that). 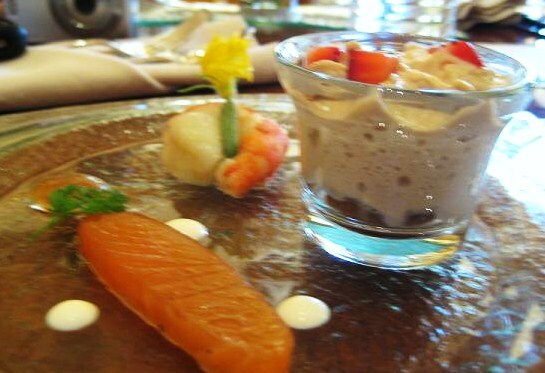 The private dinners, “Grand Tasting” and “Grand Gala” banquet are the events for those appetites. I will attend each of the above events, but I’m also quite interested in the serious side of “Uncork’d”-the events that will serve for a large part of our “Klatsch” discussion. For those of us, and I count you among this group, who are intensely interested in food, cooking and dining, “Uncork’d” gives one the opportunity to attend seminars as far ranging as cooking classes on how to make sushi, (from one of the city’s top sushi chefs), to how to make some of the world-class desserts served in Las Vegas, (from two of America’s rising-star pastry chefs). I’ll be reporting on two “Culinary Conversations,” where panels of Chefs and Food Writers will discuss the influence of French cuisine in Las Vegas, (a panel composed of names that will surprise and amaze you). I’m attending a panel discussion on how Chefs in Las Vegas create a “farm to table” cuisine in this unique desert environment. (As you know, last year I reported on the “soul” of the restaurants in Las Vegas as a part of a report on Uncork’d. The discussion of “soul” largely centered on the issue of “farm-fresh” and “seasonal,” “local” products). I’ll do my best to report the events to you in a timely manner. But rather than rush to the computer the moment after I put the fork down, we’ll take the time to let our story unfold and the discussions to follow. Tonight I’ll be attending two events. 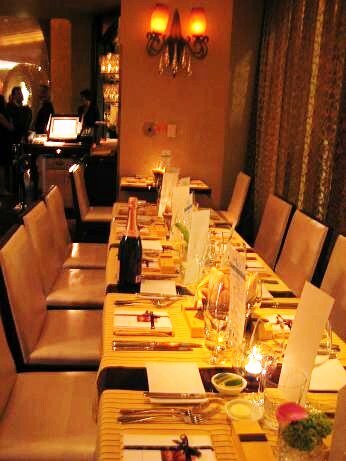 First, a private dinner that is part of the “Master Series Dinners” at Caesar’s Palace. I’ve chosen the dinner at Payard Patisserie and Bistro hosted by Chef Francois Payard and Alan Richman-both luminaries in their respective fields of French Cuisine and Food Journalism. I'm interested in finding out why Chef Payard's Pastry shop is so wildly popular in Las Vegas-and if he finds his operations in Las Vegas vastly different from his signature restaurant in New York. Alan, fresh off winning more James Beard Journalism Awards earlier this week, is seen as one of the "stars" of "Uncork'd." (Yet I am quite sure Alan, ever the gracious host, hardly sees himself as a star). Following that dinner, I’ll be going to the MGM Grand for an intriguing event billed as “Theater in the Kitchen” featuring Chef Joel Robuchon and performers of Cirque du Soleil. I have a surprise in store and I will either become a terrible embarrassment-or be the hit of the party. 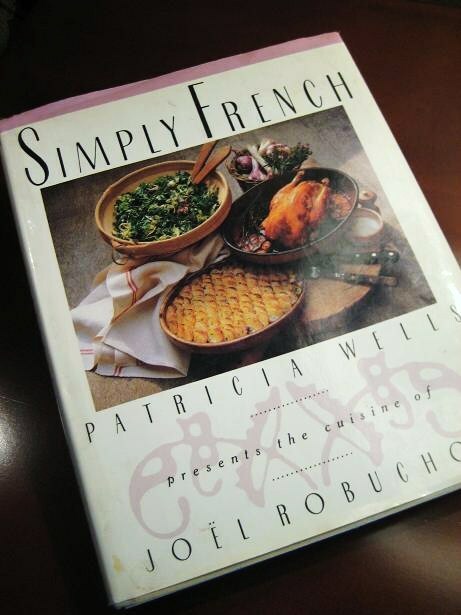 I’m bringing an older Robuchon cookbook, one probably forgotten since the time it was written over 18 years ago-“Simply French” written by Patricia Wells. 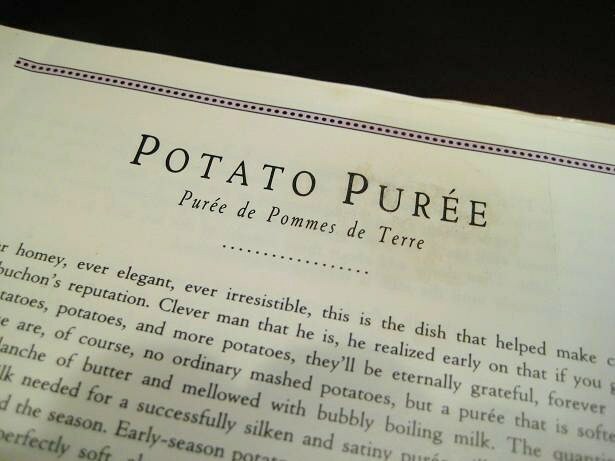 From what I know, the cookbook was the first time American home cooks were introduced to Robuchon’s signature “Puree de Pommes de Terre.” I’m hoping the Chef will be pleased and happy to write his autograph on page 183. Before we delve into the individual events, one important question to consider is whether or not culinary events like “Uncork’d” are both relevant and appropriate. 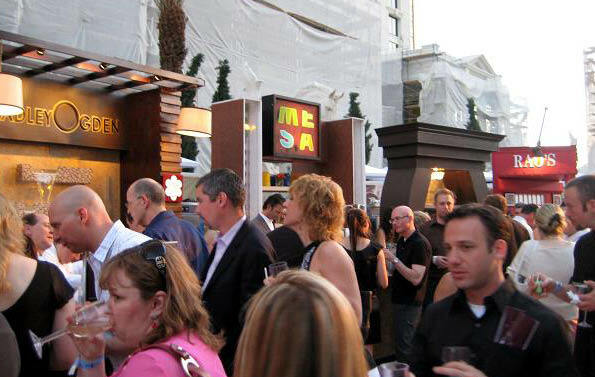 Las Vegas is the host to any number of culinary events throughout the year. That’s not really much of a surprise given the number of exceptional restaurants, top chefs and hotels that reside in this very small, unique strip of real estate. Of course, Las Vegas isn’t the only city that hosts culinary events. We’ve all attended events focused on food and dining-in Beaver Creek, Colorado, South Beach, Florida, and New York, New York. Some will argue that such events are inappropriate given the hard economic times-and the fact that the restaurant industry in America is suffering. Trust me when I tell you that Las Vegas is a microcosm of the current state of the economy-and the evidence of the downturn is apparent throughout the restaurant community. Is this the time for the restaurant industry to retreat and ride things out, or, is this the time to seize an opportunity, (through culinary events), to promote the restaurant industry? Producing an event like “Uncork’d” takes untold hours of commitment by many people, not to mention the budgets that must be involved. Imagine trying to coordinate the travel arrangements for Joel Robuchon, Guy Savoy and Alain Ducasse-and many, many other luminaries that are attending “Uncork’d.” Does the effort have value? Is that experience, in and of itself, enough? The formal Uncork’d events got underway on Thursday night with the “Master Series Dinners” at Caesar’s Palace. The Master Series Dinners give a small, exclusive group of people the opportunity to privately dine and meet some of the most recognizable Chefs of the day including Bobby Flay, Cat Cora and Guy Savoy. I certainly understand what an amazing opportunity it might be for someone to be a guest at a private dinner hosted by their favorite Food Network Star. But I took a turn away from the more popular celebrity chefs on the program and booked the dinner at Payard Patisserie and Bistro hosted by Chef Francois Payard and Alan Richman. 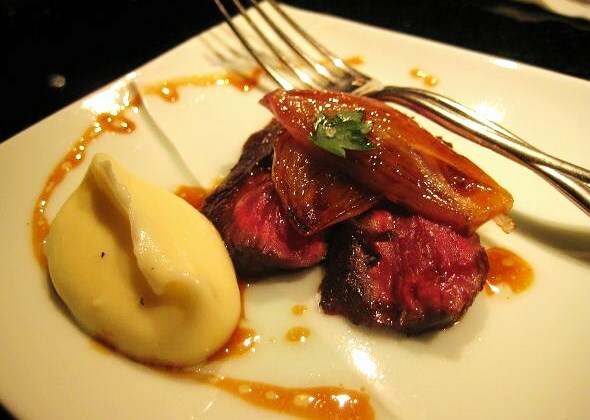 My tastes for French cuisine and my ambitions for discovering how French Chefs create beautifully clean, fresh, pure flavors are what drove me to Payard. And of course, dining with Alan is always a celebration of food, wine and conversation. (As most of you know by now, Alan just won two more James Beard Journalism Awards earlier this week. He now has so many of the medals he’s lost count). 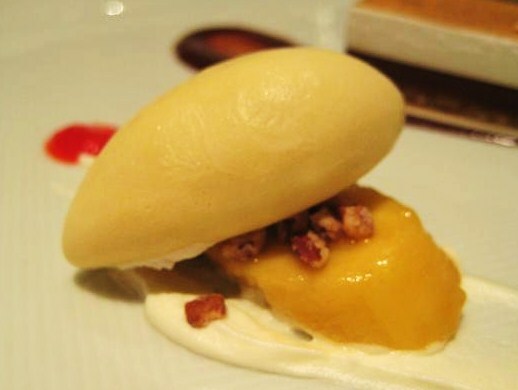 Francois Payard is a third-generation Chef. He is a very humble, unassuming, joyful man-and without a look into his resume you would never know that Francois is quite simply one of the top Pastry Chefs in the world. He has worked in the kitchens of Tour d’Argent and Lucas Carton in Paris, and both Le Bernardin and Daniel in New York. Payard is a tiny little restaurant seating no more than 30 people for breakfast only. The kitchen is just as small as the dining room-but dishes with large flavors come out of this small kitchen. Alan’s introduction to dinner set the stage-“You are in for a unique dinner-one of the world’s best pastry chefs is going to cook you lamb chops.” As you will see in the following photographs, the Chefs and staff were more than up to the challenge of serving a special dinner. We were greeted with an Amuse Bouche of Foie Gras Terrine with Cranberry and Green Apple Chutney served with flutes of Veuve Cliquot Rose Champagne. 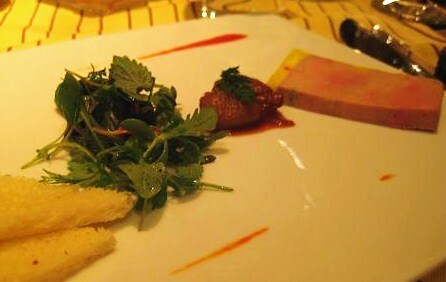 This was a more generous serving of the foie gras we had been treated to as we entered the dining room. I preferred the sweet-tart Cranberry and Green Apple Chutney served with the first foie gras dish because the fruit perfectly accented the flavors of the terrine. This was a very delicate version of a ceviche. 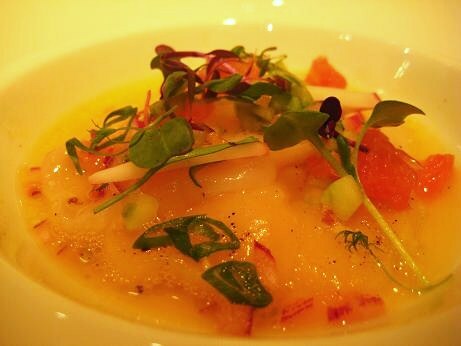 The scallop was sliced thin to soften the texture of the meat and the grapefruit, typically a strong citrus flavor, was done with finesse so as not to overpower the sweetness of the scallop. The lamb jus was poured tableside. I am not a fan of “crusting” lamb and this dish did nothing to change my mind on the technique. The crust was composed more of panko crumbs than pistachio, and the result was merely a layer of breading that interfered with the delicious, tender baby chop that lay beneath. In my mind, the actual star of this dish was quite a surprise given the fact it is early May. The tomato-zuchinni “tart”, really just layers of vegetables on top of a thin crouton, had the depth of flavor that you expect would come from vegetables out of your garden during the heat of mid-July. As you can see, this is certainly not the same sort of Pina Colada one sees slugged up and down the strip in plastic guzzlers. No, this is the refined version of a Pina Colada. 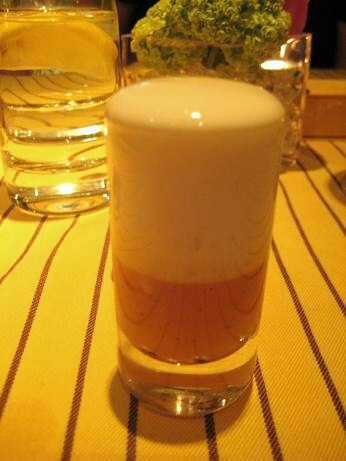 The top layer was made of cool coconut foam, the “hot” layer underneath was a warm, syrupy base of mango and pineapple juice. 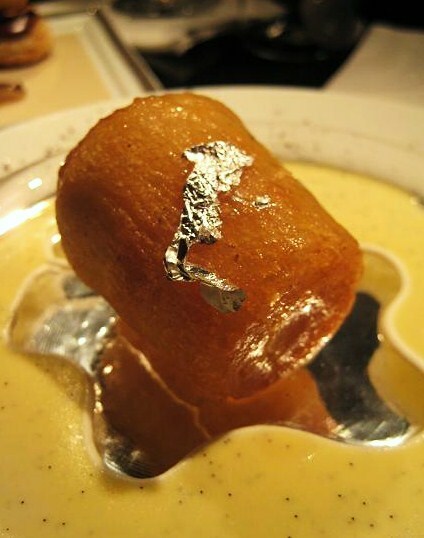 Laying in the bottom of the glass was a bed of candied pineapple cooked with vanilla. 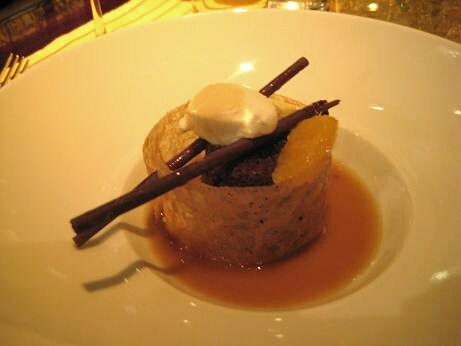 Leave it to the French to trump the British over one of their classic desserts-Sticky Toffee Pudding. I got worried when I saw “Brown Sugar Rum Sauce” on the menu as I feared, (as only an American home cook would), that the brown sugar would be grainy and overly sweet. Of course Chef Payard’s sauce was silky and light and not the heavy, down-trodden sauce I spoon over my pudding. I hope you’ll agree with me that the photographic portraits of the dishes served at our Payard dinner are quite tempting. But it begs that we ask a question-is there something more to the Master Series Dinners that goes beyond having a popular Chef sign your dinner card? The Master Series Dinners allow us to look beyond what our assumptions may be about the lack of depth and soul in the kitchens of Las Vegas. Beauty can be, in the case of these restaurants (and Las Vegas), much deeper than what we see on the surface. When I asked Chef Payard what brought him to Las Vegas, he said it was because “Caesar’s Palace built him the most beautiful Pastry Shop he could ever imagine.” It is indeed a beautiful shop, and Chef Payard was given the added financial support to bring some of his New York crew with him to Las Vegas. 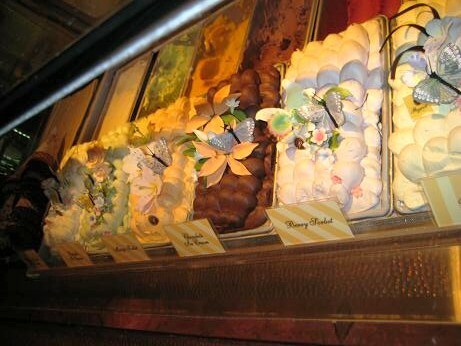 The pastry case in Las Vegas offers the same pastries sold in New York, (albeit a much smaller selection). By the way, Las Vegas loves gelato. New Yorkers have a preference for Payard cakes. New Yorkers apparently can’t get enough Payard cake. I’m a Westerner, so I’m not aware of the New York appetite for cakes. The support of Caesar’s was not the only incentive for Payard to come to Las Vegas. The Chef told me that he is able to bring his dream of beautiful pastry to the people who visit Las Vegas-people from around the world. 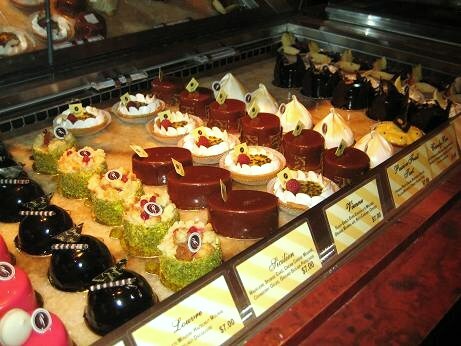 He will not allow his exacting standards to suffer in Las Vegas, he visits the Patisserie 2-3 times a month. Yes, a month. (The rumor that constantly swirls around town is that some of the more well-known Chefs are rarely in their kitchens. In the case of Chef Payard, this is factually not true). This brings us back to a question about Las Vegas that we discussed last year when I reported on Uncork’d-and one I’d like us to consider as we continue our culinary journey this year. 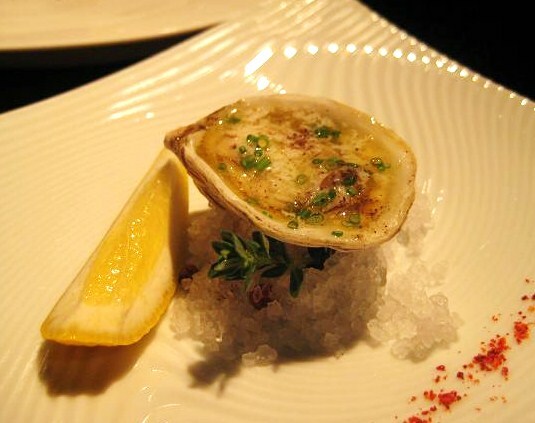 Is there a soul behind the cuisine found in the fine dining rooms in Las Vegas? Do these Master Series Dinners make that evident to the public, or is it only an issue for the food press to debate? You may be surprised by what some of Chef Payard’s fellow Frenchmen have to say about the soul and dining in Las Vegas. My next entry is about the “Theater in the Kitchen.” A visit into a world that will certainly further the debate about the culinary world of Las Vegas. David, thank you again for your excellent reporting and support of a dining scene that I have generally come around to appreciate. There is one thing, however, from this dinner that really troubles me and focuses on what I find uncomfortable about Las Vegas. Did they really serve Chilean sea bass? Was there any mention of how they sourced it? While there area few sources that fish it in a responsible manner, they are few and a small portion of what is left of that fishery. The chefs that I know that care about seafood sustainability do not serve it, because it is difficult to distinguish the sources and by serving it, it gives tacit approval to all Chilean sea bass. The deeper issue that makes me uncomfortable is a sense that it is ok to serve anything in Las Vegas if it can be sourced. I do not mean to cast that net over all the chefs and restaurants of Las Vegas as I personally know that it doesn't apply to all. Perhaps this sense is an offshoot of the city's reputation as one of excess. Having Chilean sea bass on the menu for an event like this does nothing in my mind to allay that sense. It does reinforce it, however. That being said, I don't mind the personal excess so often on display there. Flaunting very limited resources in such a high profile situation does bother me though. 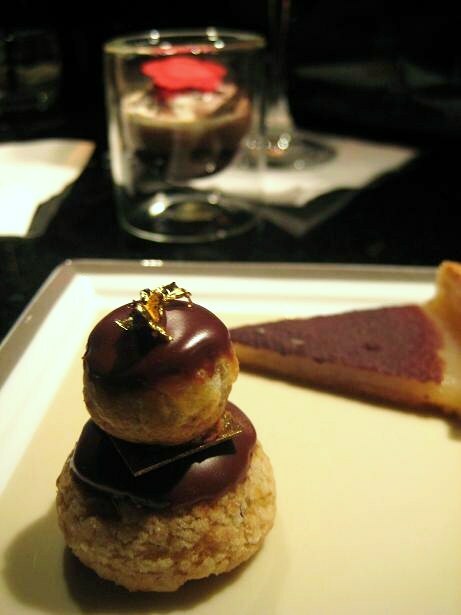 I am looking forward to your Robuchon experience. I hope you’ll agree with me that the photographic portraits of the dishes served at our Payard dinner are quite tempting. Actually, i was struck by how amateurish the plating was -- especially as compared to these! Excellent question doc. I didn't have the opportunity to speak to Chef Payard about the source of the Sea Bass. In the years prior to Chilean Sea Bass becoming an overfished species, I was able to regularly buy it at home. I think I developed a fairly good taste memory of it-and the flavor of true Chilean Sea Bass is of course quite distinct-silky yet firm in texture and a very rich flavor-almost like a very delicate, very rich halibut. Without asking the Chef, I can't say for sure if in fact he served Chilean Sea Bass-the soy glaze was a very strong flavor and it could have masked a different species of Bass that was billed as coming from Chile. It's certainly a question worth pursuing. I'll see what I can find out. Today I'm attending a panel discussion that includes Chef Rick Moonen-an advocate of sustainable fisheries and harvesting seafood in a responsible manner. I'll try to take the opportunity to ask him some questions on the Chilean Sea Bass issue. David, even if it was a different species, the fact that he would call it Chilean Sea Bass is almost as bad and in some ways worse than if it actually was. It would be worse because it would have been deceit. It is at least debatable to serve CSB from sustainable sources, but that should at least be explained, if for no other reason than pr, unless they are deliberately flaunting it. I would be curious and happy to learn of a reasonable justification. What Doc said... I'm not a food professional (sigh), but I am aware that it's a vastly overfished product, as is tilapia (Patagonian Tooth Fish, if I'm not mistaken). I was surprised to see on on the menu of a dinner of this quality! Doc, I fully agree with you and I'm glad you noticed that "Chilean Sea Bass" was on the menu at Payard. Honestly I would have overlooked this important issue. I'll be going into more detail on this subject when I get to my full report on the "Farm to Table" panel. But in short, I can share some insight about Chilean Sea Bass that I gained at this morning's discussion. Chilean Sea Bass, (the true name of the species being Patagonian Toothfish), has been overfished and scarred the environment. The fishing methods typically used involved huge nets that trap a vast bycatch of other fish and sea birds. On the panel this morning were Chefs Rick Moonen, Paul Bartolotta and Bradley Ogden-each proponents of fresh, seasonal, locally-sourced products. Chef Moonen is one of the leading voices among chefs when it comes to promoting sustainable seafood that is harvested using methods that are ecologically appropriate. 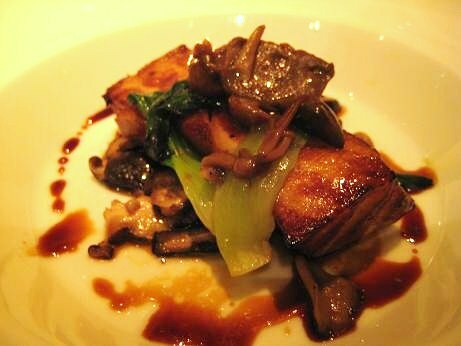 -Chilean Sea Bass should not be served on any menu, regardless of whether or not it comes from a certifiable source. (As doc pointed out, the mere association of putting an overfished species on a menu could be perceived as an endorsement of the practice-even if the fish served comes from a certifiable source). -Chefs absolutely have a responsibility to source certifiably sustainable seafood-and, they absolutely have a responsibility to share that information with their customers. -Chefs should be more than cooks. They have a responsibility to inform and promote sustainable seafood through their work-which in turn can have the effect of influencing how we, as consumers, purchase seafood to cook at home. (More on that later). The Chefs did not directly address the issue of why, or would, a Chef list Chilean Sea Bass on a menu if in fact it was another species of Bass. Certainly they agreed that would not be ethical--but I have a sense they realize it happens. They don't agree with that practice nor is it something they support. Now mind you, to be totally fair, I did not pose the question to Chef Payard as to why he chose to serve Chilean Sea Bass at the Master Series Dinner. But in doing so, doc gave us this opportunity to pursue an important discussion. Again, as I get further into our Klatsch I'll be bringing up this subject again-and a larger discussion on the subject of "Farm to Table." What we can say is that bringing a critical question like this forward is a vital piece of our "Klatsch" discussion-and the type of issue that we can uncover in our reporting on the serious side of "Uncork'd." My evening did not end after dinner at Payard on Thursday night. 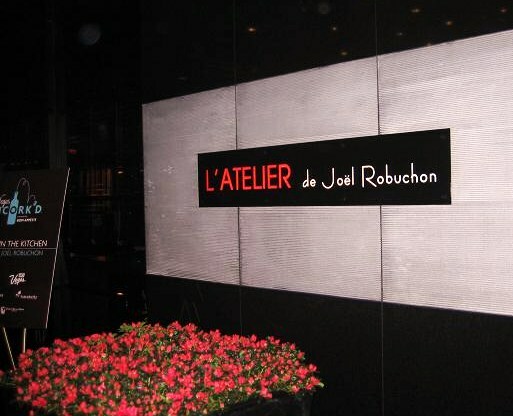 (One quick note, the current “Menu Degustation” at restaurant Robuchon next door to L’Atelier is priced at $385). From the moment I saw the inclusion of Cirque du Soleil on the program, I was skeptical. How would they pull off this “Theater in the Kitchen” with one of Las Vegas’s Cirque productions? Would this turn out to be just another over-the-top Las Vegas show production, albeit with a food theme? How would they perform in this tiny restaurant-a small kitchen surrounded by an eating bar, and how would the production maintain both the dignity and integrity of Robuchon and his cuisine? The “performance” began with the lights coming down and then the music began-a very moody, dark, brooding, opening to “Act I,” as Robuchon and one of the performers entered the kitchen. And so the production began as the staff followed into the kitchen. During normal service, up to 8 cooks “perform” in the tiny L’Atelier front kitchen. 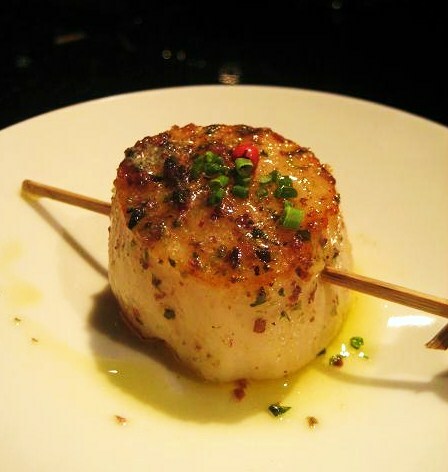 One cook to sauté the scallop, one to place the skewer, one to season and garnish, then a waiter for service. It is, quite visibly, a production. The craftsmanship displayed on the plates by the Chefs at L’Atelier is akin to the technical skills and artistry that go into creating a theatrical production, the cook as artist if you will. 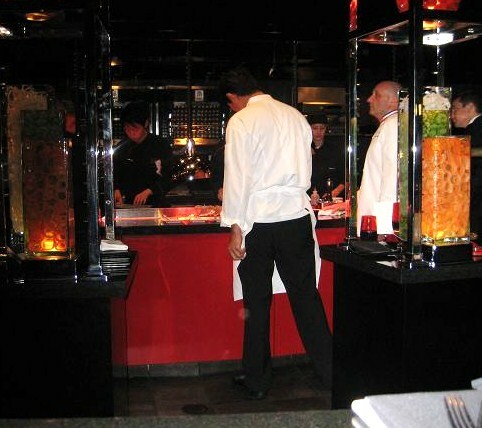 The “cast” also includes Managers, Waiters and Sommeliers. I was fortunate to have the best seat in the house-at the counter opposite Chef Claude Le Toic, Robuchon’s top Chef in Las Vegas. 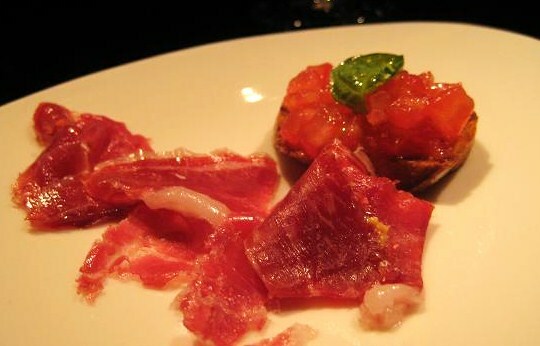 This was my first taste of Jamon Iberico. The ham had a sweet, nutty, very lightly salted flavor. I suppose one could go on longer with a descriptive narrative of the similarities between a theatrical production like “KÀ” by Cirque du Soleil and the theatrics of the Robuchon kitchen. Of course, few venues set the stage for that narrative better than Las Vegas. 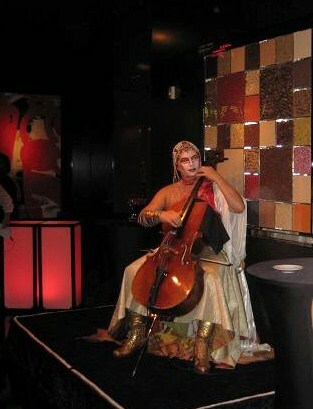 But aside from the mystical music, the lavish costumes and the beautiful vocals of the performers that night at L’Atelier, one piece of artistic expression stood out, and that was the cuisine of Robuchon. 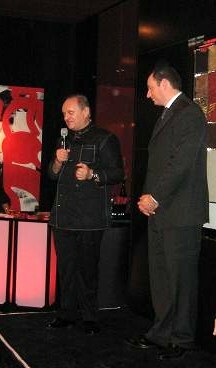 After the “performance” ended, (at 1:30am), the guests were invited to receive a “signed” copy of Robuchon’s latest cookbook, “The Complete Robuchon.” (Random House, 2008). In reality, one had to stand in line for upwards of 30 minutes to receive a pre-signed book that Robuchon then personalized with the recipients name. I had a different plan for Chef Robuchon. 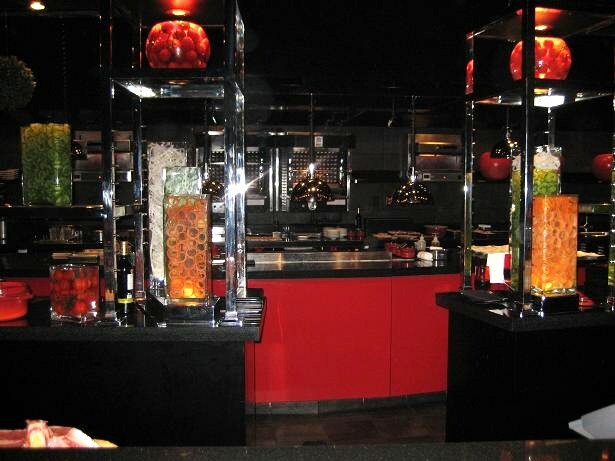 Robuchon’s recipe has become a standard in restaurants throughout the world. Yet duplicating the original is rarely done properly. The recipe involves a precise ratio of potato, milk and butter. The technique involves stirring the potatoes after they are mashed to extract moisture, and passing the puree through a tamis or strainer to break down the fibers into a silky potato puree. Chef Robuchon doesn’t speak much English. But as he made the rounds to thank the guests, I brought out my tattered, torn copy of “Simply French.” Chef Robuchon didn’t need to voice the words “thank you” in perfect English for me to realize the pleasure that I gave him by offering my copy of "Simply French." He was surprised, amazed really, and filled with pride and joy that someone had brought “Simply French” to Las Vegas. 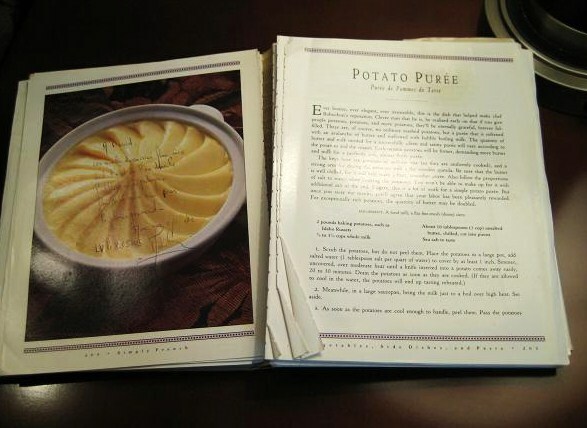 “David, the condition of these pages show that this recipe can be made by the home cook for the family. A pleasure. 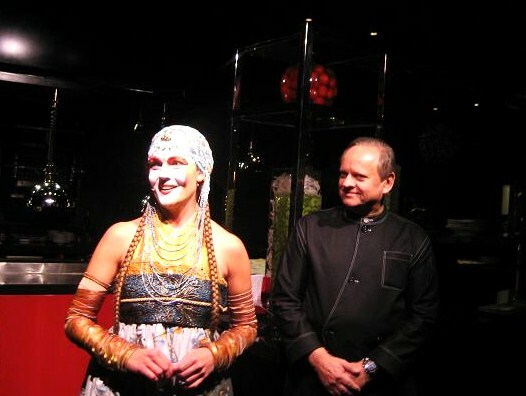 Joel Robuchon. Las Vegas, May 8, 2009." Robuchon is recognized for haute cuisine-and I am sure plenty of the guests in attendance thanked him for the voluptuous "Foie Gras Parfait." 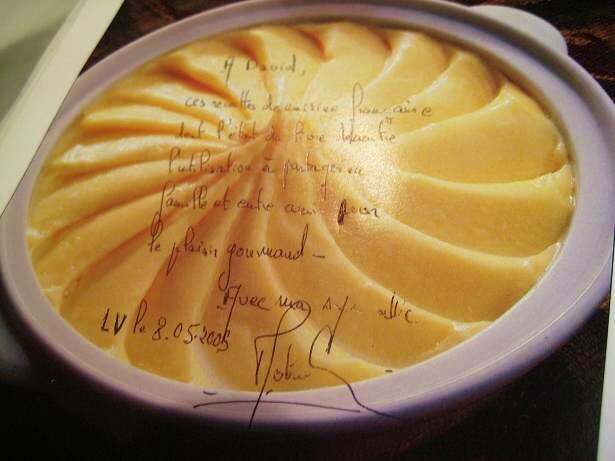 But I sensed that Robuchon was more pleased in knowing that I had cooked his potato recipe in my home kitchen. The “French Connection” panel gave guests the opportunity to meet and discusss the importance of French cuisine with three of the world’s top French Chefs, (and to witness them sitting next to one another). It was more than worth the $40 cost of the ticket. Of course you are aware of these Chefs, but I’ve added the names of their Las Vegas restaurants for our reference. 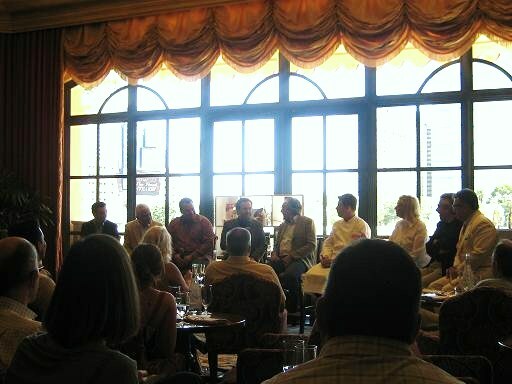 The “French Connection” panel discussion was held in the ornate Fontana Lounge at Bellagio. I suppose foie gras at 10:30a.m. is appropriate for a discussion of French cuisine on a Friday morning in Las Vegas. What I hope you will discover, just as I did, is that the opinions and thoughts of the distinguished Chefs on the “French Connection” panel are rooted in tradition. They are passionate about preserving those French culinary traditions, yet at the same time they are dedicated to furthering the “evolution” and influence of French cuisine. (Not just in Las Vegas but around the world). As the Chefs were introduced, what struck me the most were their personal stories about how growing up in a culture based on food and dining influenced their passion in life. Guy Savoy related the most poignant story, and it’s a story that speaks to the respect of the French culinary tradition. It is that sense of tradition, the “magic” of baking a cookie with simple, fresh ingredients, that is a part of the soul of these distinguished French Chefs. -Do the Chefs find any difficulty in getting quality products shipped to Las Vegas and does the product suffer during shipping? 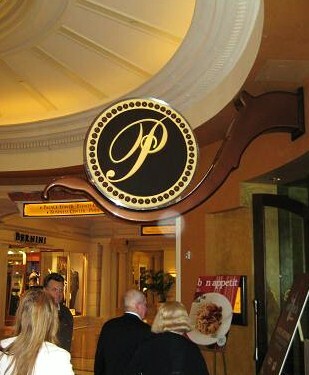 -How do the menus in Las Vegas differ from their menus in Paris? I quickly found out that this illustrious panel didn’t need to be prompted with pre-scripted questions. The answers to my questions came out naturally and were quite short and succinct. We should start with one looming question that is rabidly discussed among the food crowd, yet I’m not so sure we’ve ever really asked the Chefs. What brings a French Chef to Las Vegas? The question of bringing quality products to Las Vegas is a hotly debated subject in culinary circles-and the debate doesn’t just center on French cuisine but all of the cuisines served in Las Vegas. Yet high-end French restaurants bring the issue to the forefront. As far as Ducasse, Savoy, Boulud, Payard and Werly are concerned, there is always “FedEx!” Their focus is on finding the freshest, highest-quality, “seasonal” products-from anywhere in the world. The lobsters from the coast of Brittany and the truffles from Perigord do not suffer during the flight to Las Vegas. (We will discuss this issue of products later when I do an in-depth review of the “Farm to Table” panel). The Chefs do not create a menu that is specific to Las Vegas. They intention is to serve the same basic menu that you will find should you dine with them in Paris. 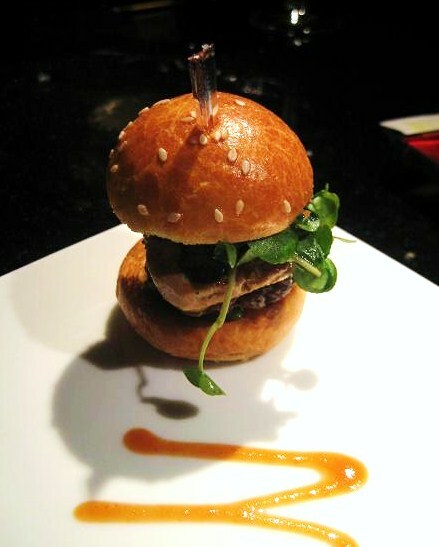 They are solely focused on Las Vegas-they want their customers to enjoy their signature cuisine in Las Vegas. To them, Las Vegas is not merely a tourist destination for Americans, but an oasis for travelers from around the globe and they want everyone to have the French experience. They do, however, appropriately change individual dishes due to product availability and the creativity of their Chefs in Las Vegas. And by the way, this issue brought forward the question of how often the Chefs come to Las Vegas. One of the great criticisms of “celebrity,” (for lack of a better word), Chefs who have restaurants in Las Vegas is that they are never in the kitchens here-and as a result the quality and integrity of the cuisine suffers. Ducasse, Savoy and Boulud were very adamant that this is not the case. First, the Chefs in their Las Vegas restaurants are as qualified, if not more so, than they are. They can not settle for anything less. I can report that the accounts of Ducasse rarely coming to Las Vegas are not accurate. 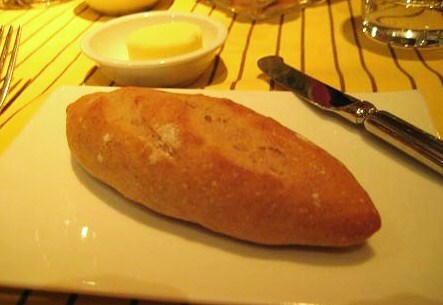 Once the discussion about issues specific to Las Vegas ended, the passion behind French tradition came forward and served to move the conversation to one of French technique and the current state of “trendy” cuisine. It wasn’t a surprise to hear the Chefs voice their passionate defense of the foundations of French cuisine-including technical skills in preparing French cuisine-the proper way to prepare a foie gras terrine or the proper method for cutting Spring vegetables. Boulud was the most vocal advocate of the French tradition, and his comments about French technique and his displeasure with young Chefs whose skills are lacking will certainly evoke some emotion and debate among us. Boulud used Chef David Chang as the basis of his argument. Now before I go further, let me say that I do not know Chef Chang nor have I ever dined at one of his restaurants. I only know of his food through the reviews I read. So I’m not qualified to explicitly endorse or deny Chef Chang’s talents. Certainly there are many people who have been amazed by his abilities. Boulud reminded the audience that Chang spent time studying at the French Culinary Institute in New York. He spent time in Boulud’s “Café Boulud” kitchen before branching out on his own. According to Boulud, Chang wouldn’t be as successful today with the cuisine he is creating if he didn’t have a French foundation to back it up. Does a young Chef today have to have a firm foundation in the traditions of French cuisine-the technical abilities, the respect of French tradition, the respect for ingredients and pure flavors-in order to be successful at the highest level? 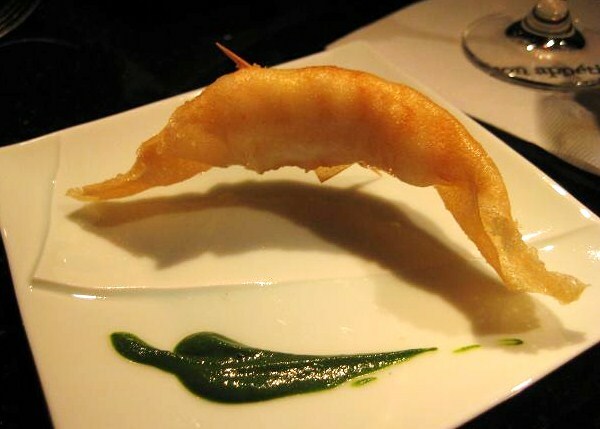 Inevitably, the entre´ of Chang into the discussion gave further impetus for the passion of the French to voice their displeasure over the “trendy” cuisine of today and the “scientific experimentation” going on in Spain. Ducasse said that “we (the French), will always have a cuisine with identity”-a personal reference to his disdain for some of the “trendy” cuisine today that lacks a true identity. Chef Werly gave a practical example with his Vacherin of Foie Gras dish. He said that without classical, technical training, a Chef could destroy a beautiful and expensive product like foie gras. At the top levels, a Chef should know how to treat foie gras. It isn’t always appropriate to pair an ingredient like foie gras with something like chocolate just to create a “fusion” dish that sounds trendy. The French Chefs couldn’t resist making a few remarks about Spanish Chefs. In particular, Boulud decried what he called is a “revolution” among the Spaniards with the “molecular gastronomy” faction on one side and the “tradionalists” on the other side. Are the Spanish Chefs on the cutting edge of developing the next great cuisine of the world-marrying the old with the new? Have they sought wisdom and skill in the French model? 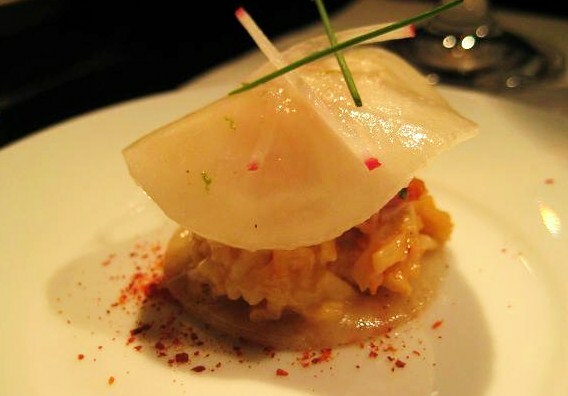 Is French cuisine “evolving?” Is it moving away from the “haute cuisine” of the past? I bring to you not just a review of the “French Connection” panel discussion, but a presentation of issues for us to debate. I don’t tacitly agree with all of the arguments supported by the French, but I certainly agree with these Chefs that the issues are of great importance in order for us to move cuisine forward. The references to the Spaniards speak of envy. 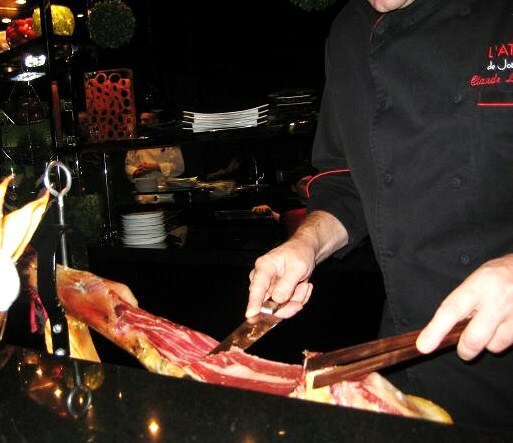 The vanguardist Spanish chefs are very well versed in their traditions and tend to incorporate them in their cooking. The only discord between traditionalists and vanguardists in Spain is from Santi Santamaria. Most of the other traditionalists realize that their own cooking and world esteem has risen because of the vanguardists and not despite them. There is no doubting the contribution and status of French cooking, but they are by no means alone, except in their own minds. It would have been nice to have had a little balance on that panel to defend those cooking from other traditions. It's funny. They speak of challenge, competition and etc., but would they, any of them, be there without financial opportunity. There is nothing wrong with that, but call a spade a spade. Thanks for adding the link to the Seafood Watch from Monterey Bay Aquarium. That was something that came up during our "Farm to Table" discussion that I'll be reporting on. The Seafood Watch encourages consumers and those in the restaurant industry to make choices to promote the health of our oceans. While I agree that it would have been interesting to have Chefs from other cuisines on a panel, in this particular case, the theme was the "French Connection" and so it was specifically directed to French Cuisine. It was pretty apparent that these Chefs are defenders, arguably elitist, in their regard of French cuisine. Certainly the financial backing of the Casino Hotels is what brought these Chefs to Las Vegas. Their contracts apparently read like the contracts of some of the top Entertainers that appear in Las Vegas. Every detail is looked over, including transportation, accomodation, a montly fee and a percentage of the monthly revenue from the restaurant. My next report will be on a class that I took at "Uncork'd"-"Culinary Revelations: Sweet Classics Gone Contemporary." Our class will be taught by two of the young Pastry Chefs of Las Vegas-and hopefully we'll learn how to create restaurant quality pastry at home. Another point I wanted to add on the issue of competition among the French Chefs is that it is as much, if not more, a matter of competition between the hotel/casinos in Las Vegas as it is a competition between Chefs. 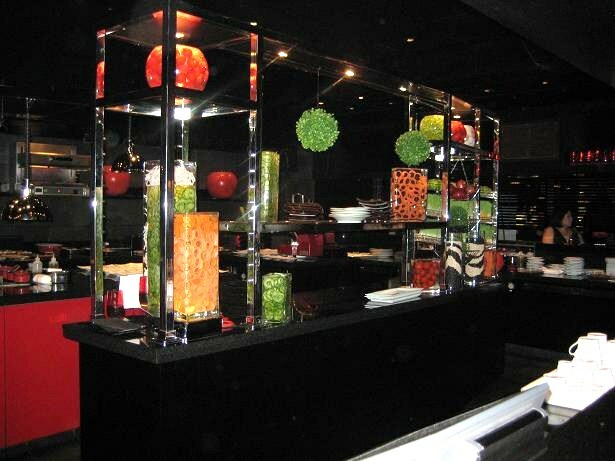 Robuchon is at the MGM which is part of the MGM-Mirage family of properties. Ducasse is at Mandalay Bay, also a part of MGM-Mirage. Savoy is at Caesar's, part of the Harrah's corporation. And Boulud is at Wynn, part of the Wynn group of hotels. Aside from the financial backing that has brought these Chefs to Las Vegas and sustained them through these difficult times-they have brought a level of cuisine that otherwise may not have otherwise been accessible to so many people. Don't get me wrong, I am quite happy that they are there. Some of their restaurants are indeed exceptional and may even be worth the money they charge. I did find the lack of discussion of finance to be disingenuous, however, when they were discussing why they were in Las Vegas. 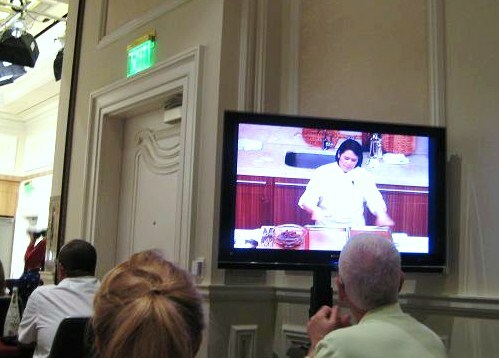 On Friday afternoon, I attended one of the “Culinary Revelations” cooking seminars that are a part of “Uncork’d.” There were classes on Sushi, Cocktails and Wine, but in my case, I chose the “Sweet Classics Gone Contemporary” class held at the Tuscany Display Kitchen at Bellagio. 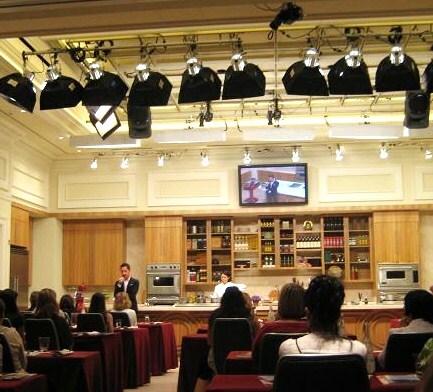 The class was hosted by Hugh Garvey, Features Editor for Bon Appetit. 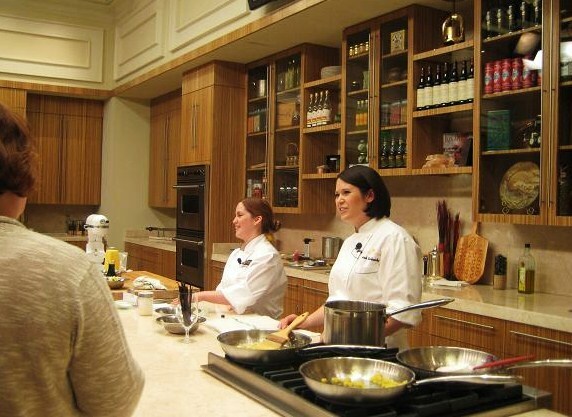 My instructor’s were two of the most talented Pastry Chefs in Las Vegas, Sarah Kosikowski-Pastry Chef at Michael Mina at Bellagio, and Robin Swenson-Pastry Chef at Olive’s at Bellagio. Chef Kosikowski was recently nominated in the Rising Star Chef category by the James Beard Foundation. Pastry is one of the many indulgences that people seek when they come to Las Vegas, but the core group of students in this class weren’t merely there to see how some of the beautiful pastries served in Las Vegas are created. The students included some very serious home cooks-part of the base demographic of Bon Appetit-home cooks who want to venture away from making Chocolate Chip Cookies and Lemon Meringue Pie. Home cooks may not venture into the world of haute French pastry served by Jean-Philippe Maury at JP Patisserie at Bellagio, but they can find inspiration and technical knowledge in lessons from professionals. You dream of Mom’s chocolate cream pie, but what’s brought to the table is a thimble of chocolate with a flourish of cream and chocolate feathers reaching a foot above the table. 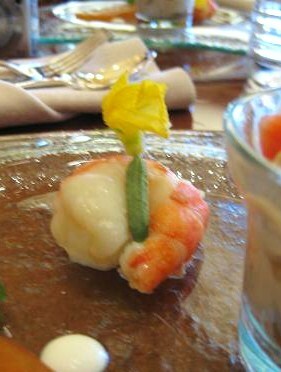 It sounds tempting and trendy on the menu, looks good on the plate, the garnishes are whimsical, but it lacks flavor. This is a perfect example of a simple pastry that we can do at home-layers of buttered phyllo blanketing a warm compote of fresh pineapple cooked in sugar and vanilla. 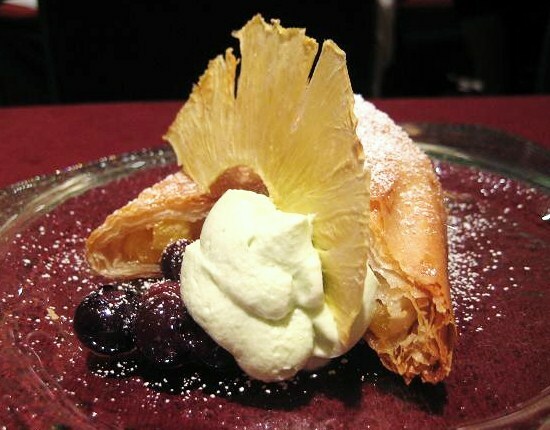 Chef Swenson garnished the dish with fresh blueberries that had been warmed in sugar and water in a sauté pan, a thin slice of pineapple, and basil cream. The home cook probably doesn’t have a meat slicer to cut paper-thin slices of pineapple, (the equipment that Chef Swenson uses in the pastry kitchen). But if you do, use it. It will give you incredibly thin slices of fruit that can be dried in a warm oven. A Mandoline slicer is a good substitute for cutting the pineapple. 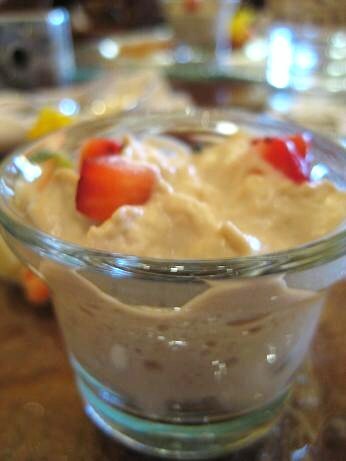 I was just as suspect of serving “basil cream” with a pastry as I was of anything sounding “trendy.” Yet once I took in the aroma of the cream and tasted it with the pineapple, I realized it made perfect sense. 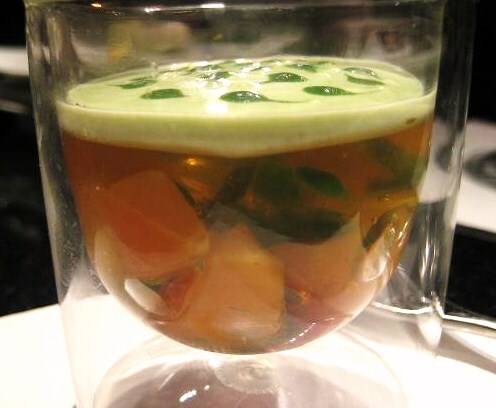 Chef Swenson starts by making a simply syrup infused with basil. She then swirls a small amount of the basil syrup into whipped cream. The cream is lifted with by the subtle flavor and scent of the basil-and it adds to the a tropical dimension to the pineapple strudel. 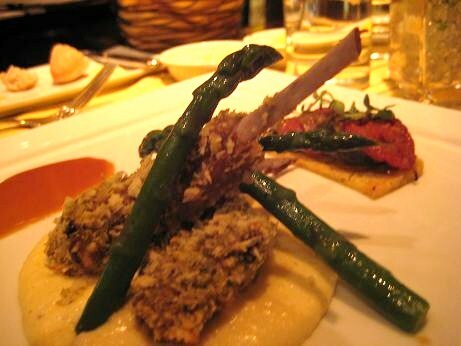 One of the signatures of the cuisine of Michael Mina are “trios” dishes. For example, on the current menu at the Las Vegas restaurant one of the entrée offerings is described as “Three Lil’ Birds-Jidori Chicken, Cavendish Farms Quail and Liberty Valley Duck.” Each of the three poultry treatments is served with individual sauces and garnishments. 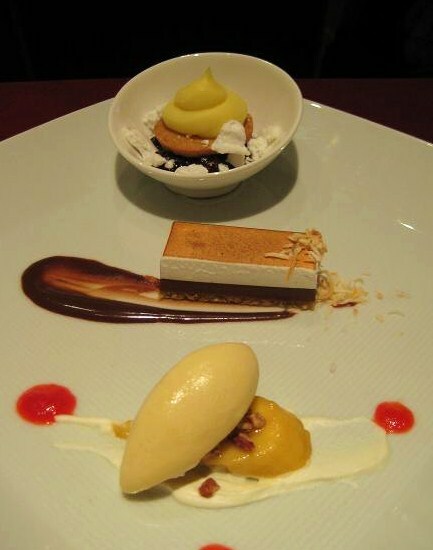 Chef Kosikowski is known for creating desserts based on classic sweets like the Banana Split. She’s given the creative rein in the restaurant to design desserts that show her personality while at the same time carrying through on the Mina “trios” theme. I realized there is in fact a thought process that goes beyond what on the surface I viewed as trendy-and it applies beautifully to what Chef Kosikowski does in the Mina pastry kitchen. And more importantly, they are pastries we can create at home. We can look beyond the mere “trendy” menu descriptions and see these pastries starting with an inspiration based on a classic dessert, then combined with the science of baking and a measure of modern creativity, (basil syrup to infuse an herbal, tropical note into whipped cream is just one example). The first part of the “trio” was composed of banana lightly cooked in syrup, malted ice cream, toasted walnuts, whipped cream and a maraschino cherry sauce. I must stop and say that the maraschino cherry sauce was the single-best taste I discovered at “Uncork’d.” It was a burst of cherry flavor like no other. I had dined on the cuisine of Robuchon the night before, but it was this little maraschino cherry garnish that won my heart in Las Vegas-and it’s something you should try at home. Simply place some maraschino cherries in a blender and process into a puree. You will have an intense, ruby-red cherry sauce that will surprise your family. This updated version of the campfire classic begins with a pastry base made of oat groats, then a layer of chocolate ganache and toasted marshmallow. 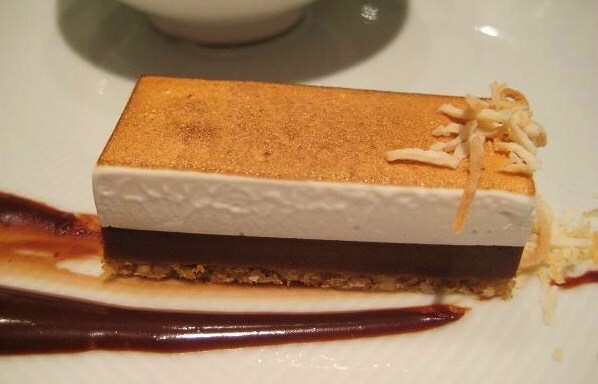 The pastry is garnished with toasted coconut and a swish of the ganache. To the point of making chocolate-based pastries, the Chef’s suggested that home cooks follow their lead in using the highest-quality ingredients. Valrhona chocolate, fresh eggs and European butter for example. Yes, these are very expensive ingredients, but the home cook uses a small enough amount that we should consider the expense worth the end result when baking at home. 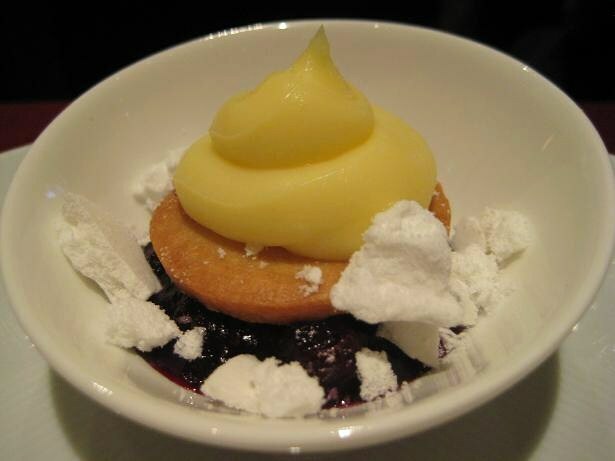 The base of the dish is blueberry, the “crust” a shortbread cookie, then lemon curd and a finale of pieces of meringue. I know I’ll be suggesting that Bon Appetit offer more of the “Culinary Revelations” classes at the 2010 “Uncork’d” events. 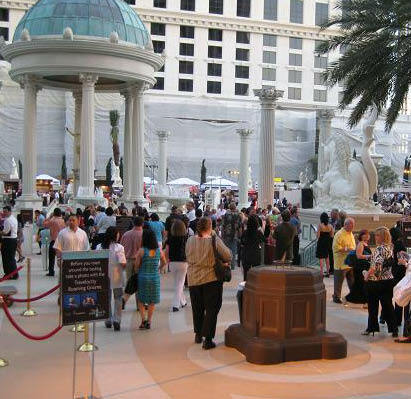 The Grand Tasting Event on Friday night was held outdoors amidst the pools of Caesar’s Palace. 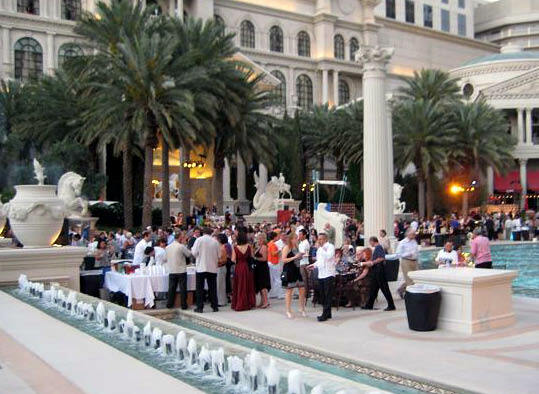 “Grand Tasting” Events are very, very popular in Las Vegas. They give the public the opportunity to meet Chefs from some of the finest restaurants in Las Vegas and taste some of their best dishes. You can read a recent report I wrote on another tasting event in Las Vegas here. The Grand Tasting at “Uncork’d” is unique from other events in that it includes the high-end restaurants like Joel Robuchon and Guy Savoy. If you had seen the throngs of ravenous people at the Grand Tasting you would have never guessed that Las Vegas is currently one of the most economically depressed cities in America. I’ve been attending this event for three years and this was by far the biggest crowd that I’ve witnessed at the Grand Tasting. The public has a voracious appetite, literally, for these large events where they have the opportunity to sample “Potato Chips Fried in Goose Fat” served with “Truffle Mayonnaise.” (It was very good). I typically prefer the more intimate settings offered at Uncork’d like the private dinners, the “Culinary Conversations,” and the “Culinary Revelations” classes. But I also realize the benefit of a Grand Tasting-and it can be a great venue for people watching and sampling some delicious bites from the best restaurants in Las Vegas. The contingent of well-known Chefs in attendance at the Grand Tasting have a huge influence in drawing the public to these events. And, in turn, they have the added effect of drawing people to many of the restaurants in Las Vegas that have booths at the Grand Tasting. 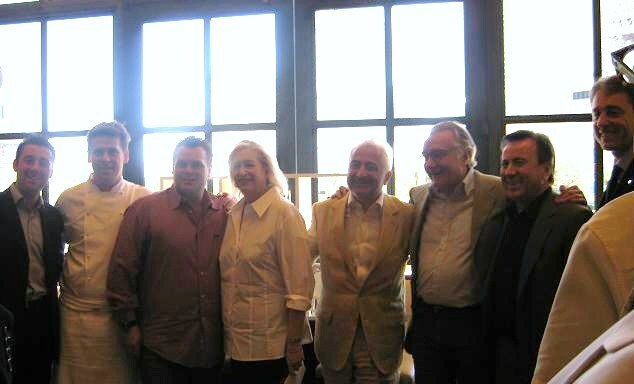 Another unique aspect of the Grand Tasting at “Uncork’d” is that the public has the opportunity to meet well-known Chefs and cookbook authors like Chef Tom Collichio, Chef Hubert Keller. Do these events merely serve as public relations vehicles? Or-do you think that a Grand Tasting event has an impact on how consumers dine and make choices in how they cook at home?